Nice, France weighs heavily and brings home the point, tomorrow is promised to no one. The tragic mass-killing of Bastille Day celebrants in Nice, France may not have been a planned terrorist attack, but its consequences are no less extremely sad and equally infuriating. We heard about comments made from neighbors of the truck driver that he was not that religious, was undergoing a divorce and was not handling it very well and apparently snapped. It matters not if that explanation makes sense in the wake of a senseless act of running over a hundred or so people, killing around 84, including children. The man was shot dead by police, so little else will ever be directly known from the Tunisian known mostly for petty criminal acts but no known terrorist affiliations. Blame rests with the United States, indirectly, and more directly with the shadow globalists that runs US war-creating actions around the globe. Decades ago, US neocons plotted to destabilize the Middle East. Concurrently, it was the US that conspired to create the European Union and destroy European national sovereignty. The globalists plans for a New World Order, using the template of creating massive domestic and world Problems, watching the anticipated Reactions of the masses, and introducing their desired outcome in the form of Solutions, and the final Solutions were always for their benefit and always entailed loss of freedoms for individuals and sovereign nations. The world has to deal with people like Kissinger and Soros. Highly visible proponents of the NWO, Soros in particular using his ill-gotten wealth to subsidize many organizations that are created to disrupt societies around the world using his nonprofit Open Society Foundations. We keep saying to always follow the money. In our opinion, Soros is one of the leading sources that targets and funds groups that create fractionalizing elements all around the globe to create distractions and polarization. Kissinger uses his political might to further the NWO agenda in no less a dangerously and fractionalizing manner. Back to Soros. He is suspected as being one of the primary money sources responsible for enabling the migration of so many Muslim immigrants flooding into Europe and creating enormous problems for the people of Europe. Disgustingly, the heads of many European countries, especially German Chancellor Angela Merkel, are the promoting agents forcing countries to take in displaced Muslims, Muslims who have no interest in integrating themselves into polarized Western cultures. Back to the United States. This country has earned the reviled status of being the most dangerous nation on the planet. No other country has done more to destroy the Middle East than the US. No other country has done more to destroy Europe than the US. No other country has done more to destabilize South America than the US. No other country has done more to ruin the lives of American citizens than the corporate federal government of the US. The entire European Union is run by overpaid sycophants that would not otherwise be qualified to hold a regular job or get elected to anything else. Their positions are given to them so they can serve the globalists and not sovereign nations. What a mess that part of the world is. What a mess the Middle East is. What a mess it is within the United States. This is how the elites function. Nice, France is an infuriating example, an extremely sad symptom of all that is going wrong thoughout the world, all in the service of the NWO Problem, Reaction, Solution template that is tearing away the fabric of independent human existence, all in the service of a mentally deprived, psychopathic elite 1/10th of 1% that want to control the money, which they do, and cull the population of the world, maybe by a few billion more people, which they are doing through war, chemtrails, forced vaccines that produce deaths, chemically treated world crops that are nutritionally void and harmful to the immune system, poisoning whatever can be poisoned to reduce human independence, replaced with servile dependence on the NWO. New World Order tragedies will never end. Count on it. It is hard to transition from world problems to the topic of gold and silver, but ironically, it is the absence of gold and silver within the financial structure of world currencies that brought about all of the horrendous changes occurring throughout the world. One of the very first acts of the elites is to steal and gain control of all the gold and silver. It is why there is not a single currency on the planet that is specie-backed by either precious metal. Gold and silver are more than just a wealth preserver, they are, in all likelihood also life-preserving, for without them, there is no means of defending against the globalists and their drive for a cashless society. What else does one have without gold and silver? Paper holdings? What is the intrinsic value of any paper asset, except as transitory in perceived “value.” Once perceptions change, so do the corresponding “values” which are reduced considerably or worse, simply disappear. What is truth? For too many, unexamined beliefs are truth, but those beliefs may not be founded in reality. Truth should reflect reality and withstand any assault to alter it. Knowledge is said to be power, but knowledge is useless if not put to productive use. For us, knowledge leads to truth, to the crack in everything. It is how the light gets in. Gold has the appearance of undergoing a correction from the early July swing high, and that makes it somewhat featureless, for lack of a better description. There are times one needs to simply be idle until greater clarity emerges. This seems to be one of those times, at least from the perspective of the faux-paper market where one will not find a single hint of supply/demand reality. Chalk that up to the power of those who control the world’s fiat. It is apparent that the near-term trend is undergoing a correction, evidenced by the bars form the last 8 TDs. [Trading Days]. However, note how labored and overlapping they are, in contrast to the first 3 TD rally in July. 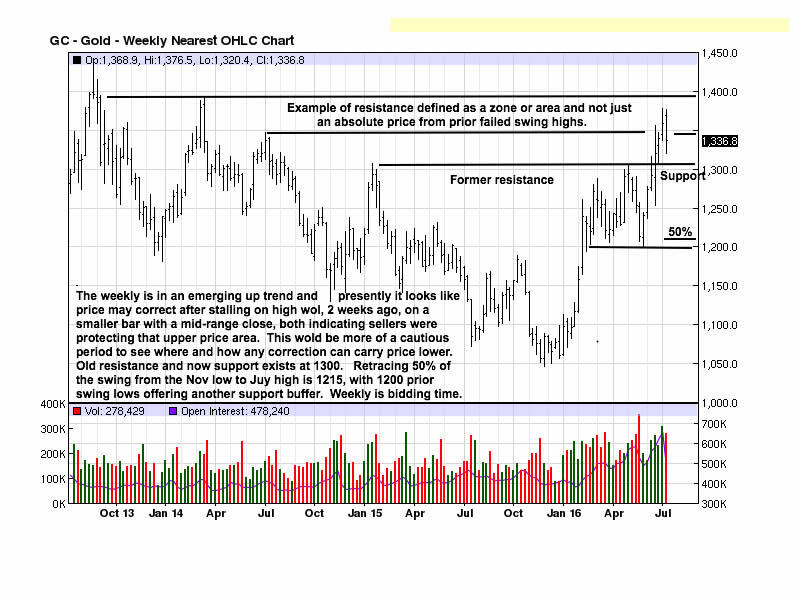 Fast up, slow down, typical behavior in an up trending market. There is not a lot of symmetry in potential support from the weekly and daily charts, so one has to give more room as to where any correction may end. 1300 looks strong on the weekly, but not on the daily. 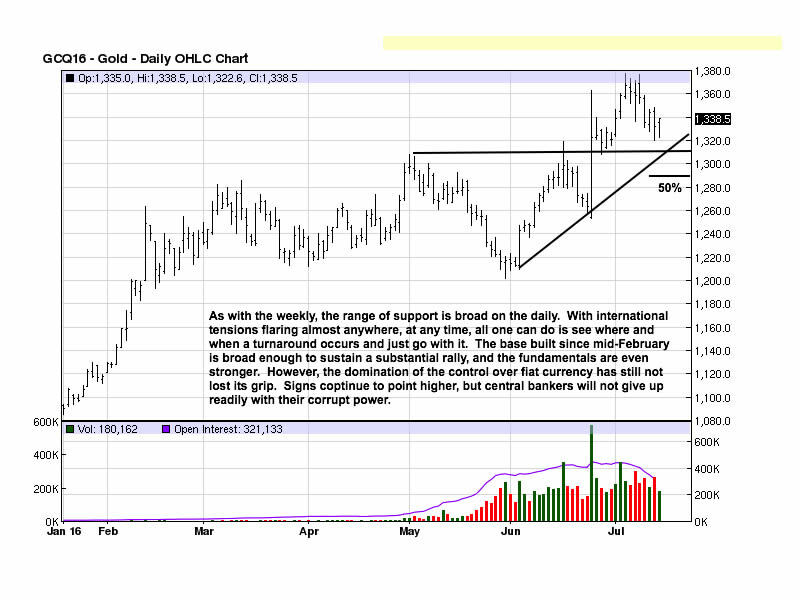 There are a few points of possible support on the daily, from 1320 to 1290. Best just to let the market run its course. We almost always use the words “potential” and “possible” when describing support or resistance levels, not to be ambiguous, but potential remains potential until it is proven. Some may prefer more concrete observations, but the markets are never that concrete. Those who seek more absolutes simply do not appreciate the unrelenting nature of the market to always define itself on its own terms and not as some may choose to surmise. 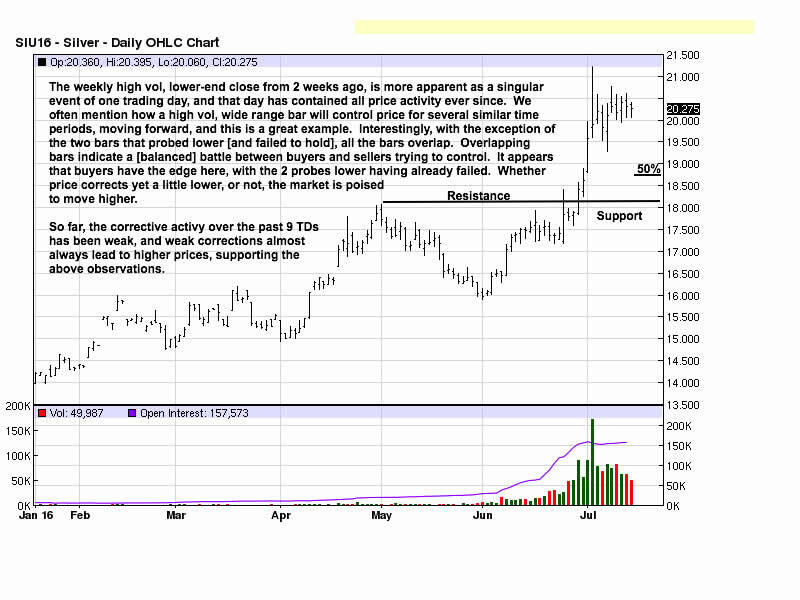 18.60 offered no resistance, so the adjective “potential” would have applied as it was never proven to be otherwise. 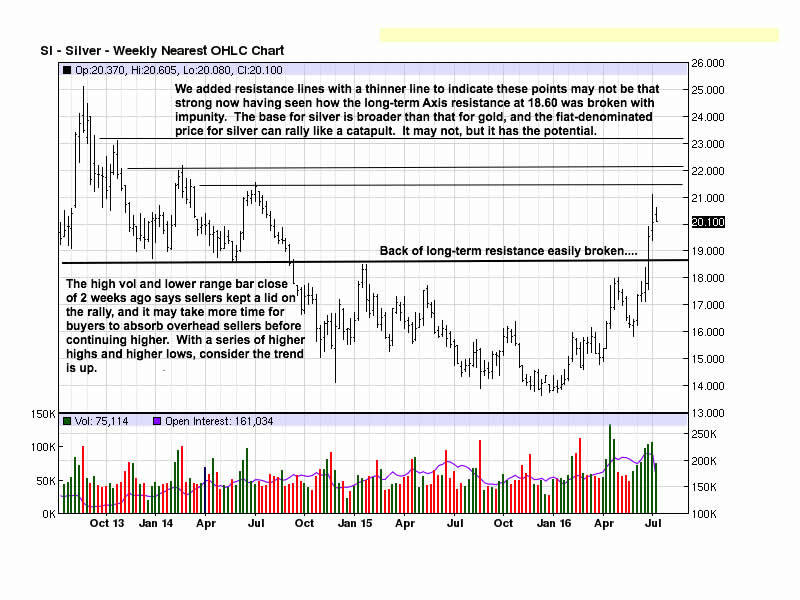 Little can be added to the chart comments other than to comment on the gold:silver ratio. For months, we have been saying silver is preferred over gold by virtue of the historically high gold:silver ratio, when it was running around 84:1. For those unfamiliar with this ratio, at 84:1, it would take 84 ounces of silver to buy one ounce of gold. The probability of the ratio contracting was high. 15:1 used to be a long-standing relationship between the two metals, so expectations as to where the ratio may head is purely conjecture but one with a higher than not probability backing it. A few months ago, to serve as an example, we traded some gold for silver at 75:1, when the ratio was nearer 80:1, the difference being transaction costs but not out-of-pocket expense. Ten ounces of gold translated into acquiring 750 ounces of silver. With the ratio currently running around 66:1, we got more silver than is currently available in a switch from gold into silver. Were the ratio drop to 40:1, the 750 ounces, using a 4 ounce cost for switching and making the ratio 44:1, the 750 ounces can be traded for 17 ounces of gold. That represents a 70% gain in the number of ounces for one’s gold holdings by managing the gold:silver ratio. If the ratio were to contract to 30:1, 20:1, even 15:1, the results are even better. For those who dismiss this option because they do not like the idea of a transaction cost, the numbers do not lie, but if that is your preference, you would still hold your 10 ounces, unchanged over time. Silver remains the preferred metal based on the reality of an expanding and contracting gold:silver ratio.